Show your support for breast cancer research with a Pink Ribbon two-page-per-week refill. Day-Timer will donate a portion of the proceeds from this product to The Breast Cancer Research Foundation. Sophisticated, black-and-white floral bouquets tied with a soft pink ribbon adorn every page. Monthly tabs have a coordinating design. The easy-to-use, two-page-per-week format shows the entire week on two facing pages with ruled daily entries with columns to organize each day, hourly appointment times from 8 AM to 5 PM and past, current and future months reference. 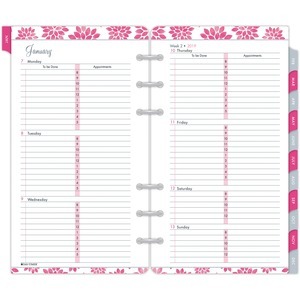 Tabbed monthly dividers are ideal for advance planning. Refill includes reference pages and a page locator and ranges 12 months from January to December. Six-hole punched design allows the refill to be used in six-ring binders.